It was time for a “quick” dinner which helped me use up more of our canned goods in the pantry. Brown rice isn’t quick, but it is hands-off 99% of the cooking time. Preheat the oven to 375°. Add 2½ cups boiling water, 1½ cups long grain brown rice and ¼ tsp kosher salt to an 8×8″ glass baking dish. Cover tightly with foil, bake for an hour. 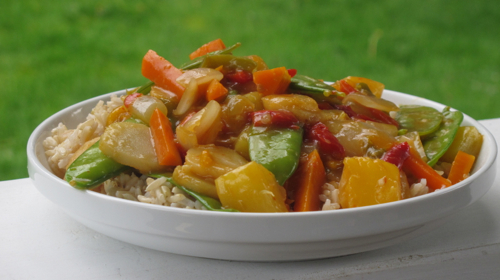 Heat a large skillet or wok over medium-high, add the oil, onion, peppers and carrots, cook until crisp-tender. Add in the garlic, water chestnuts, snow peas and drained pineapple, cook until sizzling. Whisk together the pineapple juice and remaining ingredients, pour over, turn to low and toss, sauce will thicken quickly. take off the heat and serve over the rice.